Figure 2. 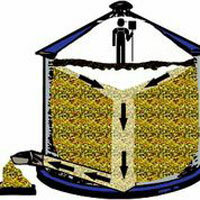 When a crust forms on grain, a pocket can form underneath as grain is moved out of the bin. Figure 3. 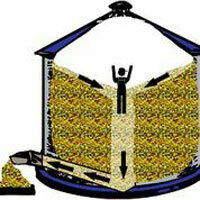 When a bridge of crusted grain breaks, a worker can fall in, becoming entrapped as the grain flows in to fill the space. Grain wall avalanche. 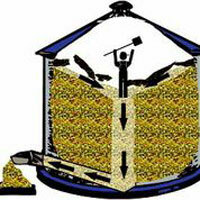 Frozen or out-of-condition grain can cling to the bin's sidewalls and when prodded, flow to the bin floor. Don't underestimate the amount of grain involved and don't work where the grain wall is higher than you are. Wear a safety harness. Understand the hazards on your farm, think through the possible scenarios of what could happen, plan how to avoid them and, if necessary, how to respond. Entrapment Risk due to Flowing Grain. published in the Ag Safety and Health section of eXtension, a collaborative university information resource. 2012. Central States Center for Agricultural Safety and Health at the University of Nebraska Medical Center, provides research and information for farmers. Health projects engage producers throughout the seven-state region.